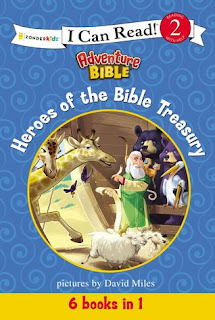 The Adventure Bible: Heroes of the Bible Treasury is a very well put together book. I have read a few of the smaller books to my kiddo before, and she really liked them. Now to have an assortment together, that works its way through several of the most well known Bible stories was a nice treat. The reading level for this book is on a 2, and I will say it spot on. It wasn't so easy, that we flew through it, but it wasn't too hard to where she couldn't understand what was happening. It was a book that was nice size for my kiddo to read to me. The pictures are bright and drawn in a very eye catching way and helped emphasize and explain perfectly what she was reading. She loved the Noah's Ark story and the fact it had giraffes. That was a win/win for her. The detail was fun and helped keep attention on the stories. This book was enjoyable and I loved how it help build reading confidence in my kiddo and offered her the ability to read to me.